L'Oréal – They’re simply not worth it! After fifty years of communist occupation, the last Russian soldier finally left the Eastern European country of Lithuania in 1993. Despite many hardships, Lithuania’s people strived to help their animals but the Soviet Union withdrew all veterinary supplies and, faced with hardly any drugs, the veterinarians were struggling to help cure even simple ailments. This was the dire situation witnessed by Naturewatch Foundation when the charity first visited Lithuania at the request of the newly re-formed Lithuanian Society for the Protection of animals (LiSPA). A few months later, Naturewatch Foundation returned to Lithuania with more than £10,000 worth of veterinary drugs and vital new equipment, plus in excess of another £10,000 of drugs and medicines donated by vets from around the UK. A second journey followed, this time overland, when Naturewatch Foundation delivered a new, large animal transportation trailer filled with veterinary medicines and other supplies for the Lithuanian Veterinary Academy. 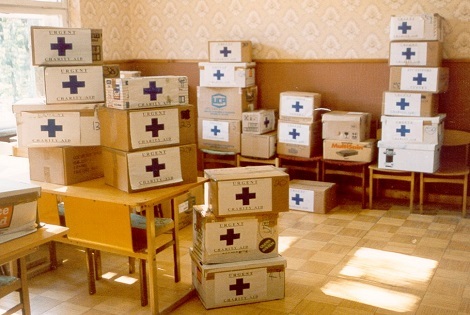 The following year, a third aid consignment was sent by sea. In order to learn about new veterinary techniques, Naturewatch Foundation organised and sponsored seven veterinary teaching professors from the Lithuanian Veterinary Academy(LVA) to attend a week-long course at Edinburgh University. In addition, new contacts were forged between the Lithuanian professors and their counterparts in the UK which all led to the sharing of much-needed animal welfare knowledge and techniques. In 1998, Naturewatch Foundation fought a bureaucratic battle to set up the first animal shelter in Kaunas. In a country where land ownership was unheard of and where foreign ownership was still illegal, the mechanisms of ensuring security of tenure before commencement of building were all new and we found ourselves in uncharted waters. In 1999, as a direct result of the findings presented by Naturewatch Foundation, the Lithuanian Government introduced new welfare protection measures for horses. The Foundation continued to support the development of The Lithuanian Society for the Protection of Animals (LiSPA) to restructure and resume its activity. From office equipment, covering running costs, to training and support, Naturewatch Foundation provided the boost the society so desperately needed at that time. In 2000, Naturewatch Foundation battled with the city council to install a water source at the city’s animal shelter and renovations began thanks to the funds provided by Naturewatch Foundation and its supporters. In 2001, Naturewatch Foundation used World Animal Day to expand public consciousness about animal welfare sparking a media frenzy whilst inaugurating LiSPA’s first proper office along with 19 satellite branches. In 2002, Naturewatch Foundation gained the support of Lithuania’s First Lady, Alma Adamkiene, to celebrate World Animal Day and used it as a central platform to launch a national education programme for primary school children. At this event, the national Government was comprehensively represented by Dr Kazimieras Lukauskas, Director of the State Food & Veterinary Service and Mr Arunas Kundrotas, the Minister of Environment. In 2003, Naturewatch Foundation sponsored the opening of LiSPA’s wildlife rehabilitation centre to treat many hundreds of animals, including a rare golden eagle, beavers, deer, foxes and a wide variety of birds of prey. In educational matters, Naturewatch Founation sponsored LiSPA to produce and publish a humane education book with an initial print run of 20,000. A copy of the book was distributed to every schoolteacher in Lithuania. (This was a joint project of the International Division of the RSPCA whereby Naturewatch Foundation funded the employment of staff to undertake the translation, printing and teacher liaison work.) Good progress was made during the year at the Kaunas animal shelter following a refurbishment programme funded by the Foundation. Work continued with proposals for a National Registration Scheme which, combined with the Humane Education programme, assisted greatly in reducing the stray animal population. In 2004, Naturewatch Foundation continued to bring about change in Lithuania. The Government ratified the European Convention for the Protection of Pet Animals. The European Zoo Directive was also transposed into Lithuanian law in 2004, forging the way to improve the quality of life for captive exotic animals. Farmers and livestock hauliers in Lithuania were required to be licensed, which involved completing a comprehensive course in animal welfare. The courses are organised jointly by the Lithuanian Veterinary Continuing Education Centre and LiSPA. Humane education is now part of the curriculum for third-year veterinary students at the Lithuanian Veterinary Academy. Farmers, livestock hauliers, State Food and Veterinary Service Animal Welfare Inspectors, Environmental Inspectors and others are all learning about the essential good practice codes of animal husbandry and welfare. In 2005, Naturewatch Foundation provided financial assistance for the Lithuanian Veterinary Academy to open its new library facility. This allowed the veterinary students to use up-to-date computer facilities to conduct their research and study. In addition, subscriptions to international publications on aspects of animal welfare were sourced so that students and teaching professors can be kept in touch with the latest developments. In 2006, Naturewatch Foundation continued to support LiSPA’s Wildlife Rescue and Rehabilitation Department which was open 24/7 and where no animal was ever refused for treatment or assistance. Further financial support was provided by Naturewatch Foundation supporters to fund the refurbishment of an existing building into a wildlife rehabilitation unit. Between 2007 and 2011, Naturewatch Foundation continued to support the Lithuanian Society for the Protection of Animals to further promote animal welfare by offering advice and guidance to local societies, as well as maintaining a strong relationship with both the Ministry of Environment and the State Veterinary Service. In 2012, following exposés on pet markets and back street animal breeders in Lithuania, the State Veterinary Service (the responsible body for all animal care in Lithuania) agreed to formal talks on our proposals to introduce legislation to address puppy farms and illegal breeders in Lithuania. Naturewatch Foundation launched and funded investigations into dogs being smuggled into the UK via the sea ports.